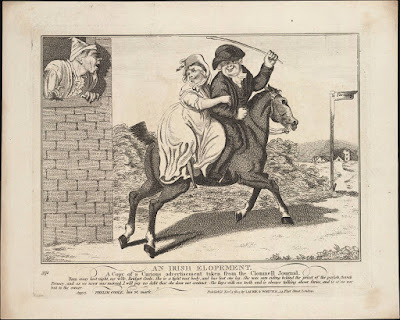 A Covent Garden Gilflurt's Guide to Life: A Tangled Matrimonial Mess! 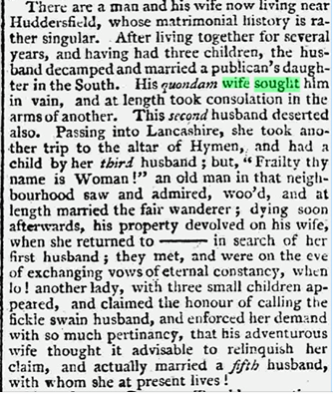 Whilst browsing through the news of the long 18th century, I found this rather scandalous little nugget of a very tangled marriage.. or five! From The Bury and Norwich Post: Or, Suffolk, Norfolk, Essex, and Cambridge Advertiser, 18th July, 1804. 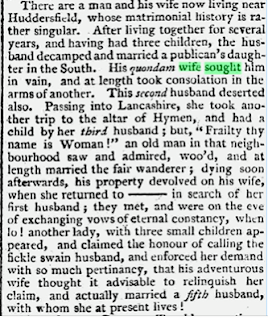 There are a man and his wife now living near Huddersfield, whose matrimonial history is rather singular. After living together for several years, and having had three children, the husband decamped and married a publican's daughter in the South. His quondam wife sough him in vain, and at length took consolation in the arms of another. This second husband deserted also. Passing into Lancashire, she took another trip to the altar of Hymen, and had a child by her third husband; but, "Frailty thy name is Woman!" an old man in the neighbourhood saw and admired, woo'd, and at length married the fair wandered dying soon afterwards, his property devolved on his wife, when she returned to --- in search of her first husband; they met, and were on the eve of exchanging vows of eternal constancy, when lo! 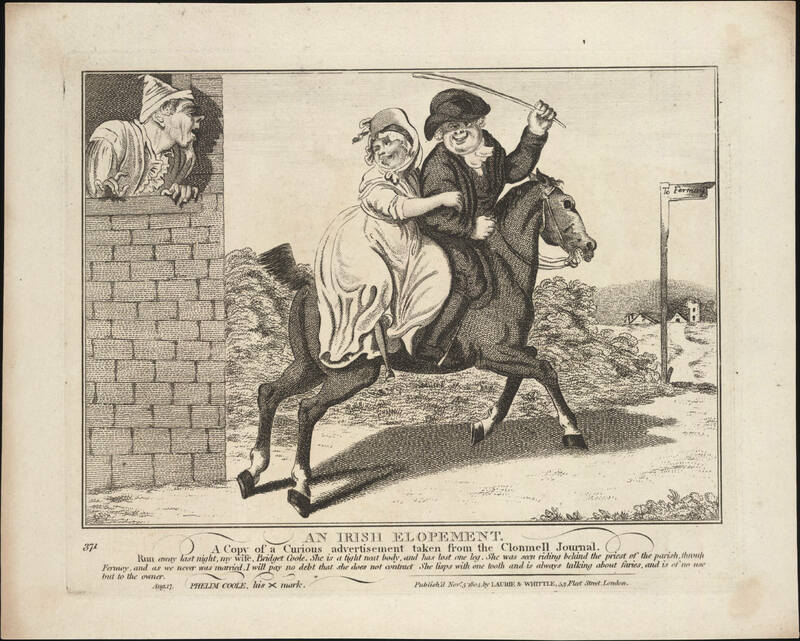 another lady, with three small children appeared, and claimed the honour of calling the fickle swain husband, and enforced her demand with so much pertinancy, that his adventurous wife thought it advisable to relinquish her claim, and actually married a fifth husband, with whom she at present lives! Pretty much like today, then. Hahaha Jude Knight! That was a funny remark but also true. I prefer to see the bride as an eternal optimist! All this without Jeremy Kyle! He missed a good one there!